This recipe was originally published on July 20, 2014, and updated with new photos and content on January 14, 2018. 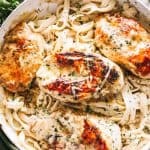 Skinny Chicken Fettuccine with Alfredo Sauce: Creamy and delicious lightened up Chicken Fettuccine prepared with a lighter and flavorful Alfredo Sauce. Hi YA! Happy Sunday, my lovelies! Wanna talk chicken?? Weeeeell okay. I mean, if we muuuust talk about chicken today then so be it. It IS Sunday, after all. 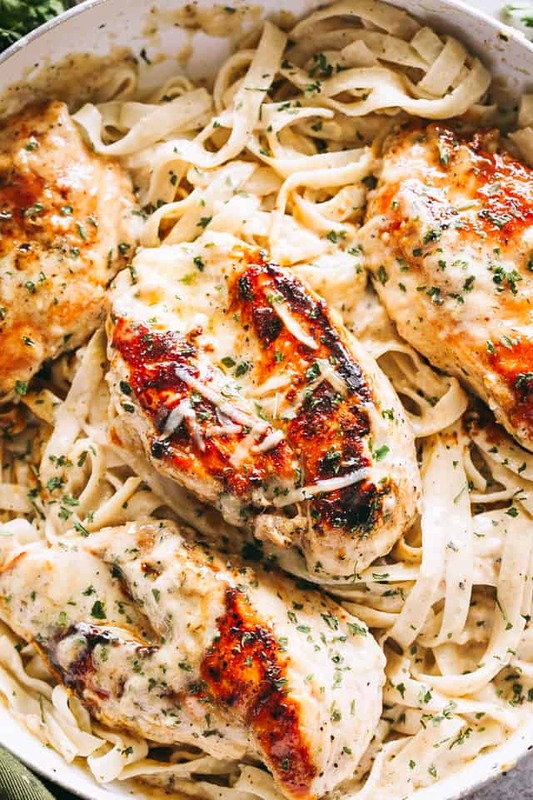 BUT, HELLLOOOOO we’re talking about CHICKEN FETTUCCINE ALFREDO! SKINNIFIED! (making-up words is a thing nowadays…) And sorry about the screams – I just want you to hear me. Back in the day, when my bod didn’t recognize calories, I would go into Olive Garden and inhale a large plate of their Chicken Fettuccine Alfredo. Then I’d sop up the remaining of the sauce with my breadsticks – I made sure to lick that plate clean. Now, I can’t even smell that beautiful alfredo sauce without gaining a few elbees. Totally unfair. Thus, what started out as an innocent effort to make a lighter sauce, turned into a full grown, must-have, can’t live without Alfredo Sauce. Also? Isn’t it funny how all these adjectives, such as, “skinny”, “healthy”, “good for you”, are totally subjective? I mean, we make one little swap in a recipe and it’s completely cool to just dub it as healthy. However, and here comes the big BUT … buuuuuut, this really, truly, 100-percently is skinnier. 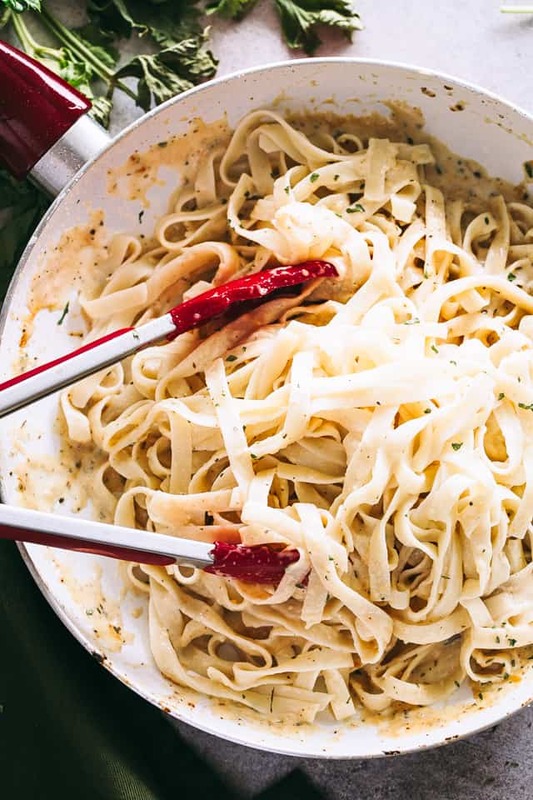 The alfredo sauce is prepared with olive oil and plain yogurt instead of butter and cream, and the real kicker is that, it is still very creamy! By the way, you can also use 1% milk in place of the yogurt. Did you know that there’s about 500+ calories per serving in a good, old fashioned alfredo sauce? That’s JUST the sauce! Eeek! Can’t buhlieve I was able to eat that and not gain an ounce. Lucky for me and you, this alfredo sauce recipe is less than half of that! In fact, this entire meal is a little over 480 calories per serving. We ain’t callin’ it skinnier for nothing. All this is going to start with a pot filled with boiling water and 8 ounces of fettuccine pasta inside of it. Heat the olive oil in a skillet and add some garlic to it. A whisk of flour will follow; please whisk it all into the liquid. Continue to whisk in the chicken broth; the whisk is your bestie when it comes to this sauce! 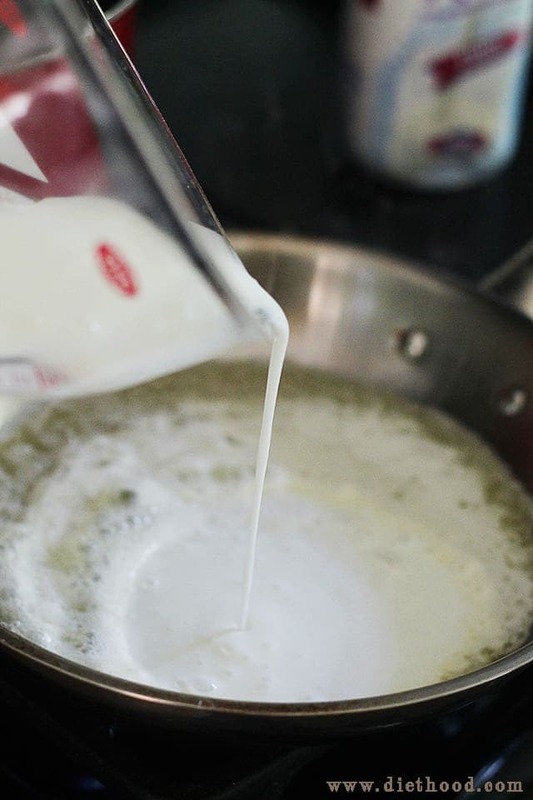 Once sauce starts to thicken, remove the skillet from heat and stir in the cheese and yogurt. To help you with the rest of dinner, please hit print! 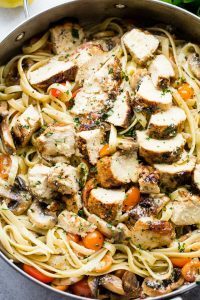 Skinny Chicken Fettuccine with Alfredo Sauce - Creamy and delicious lightened up Chicken Fettuccine prepared with a lighter and flavorful Alfredo Sauce. Cook pasta according to the directions on the box; set aside. Stir in flour; stir until combined. Slowly whisk in chicken broth. Cook and stir until mixture boils and thickens; remove from heat. Stir in parmesan cheese; stir until melted. Whisk in the yogurt; whisk until combined. Season with dried parsley, salt and pepper. Pour sauce over cooked fettuccine; mix until combined. Transfer to plates and top with previously prepared chicken. Garnish with basil ribbons and serve. I was wondering how much this recipe yeilds. Is it enough for two people? If not then I know to buy more ingredients. I am assuming it makes enough but I want to be sure. 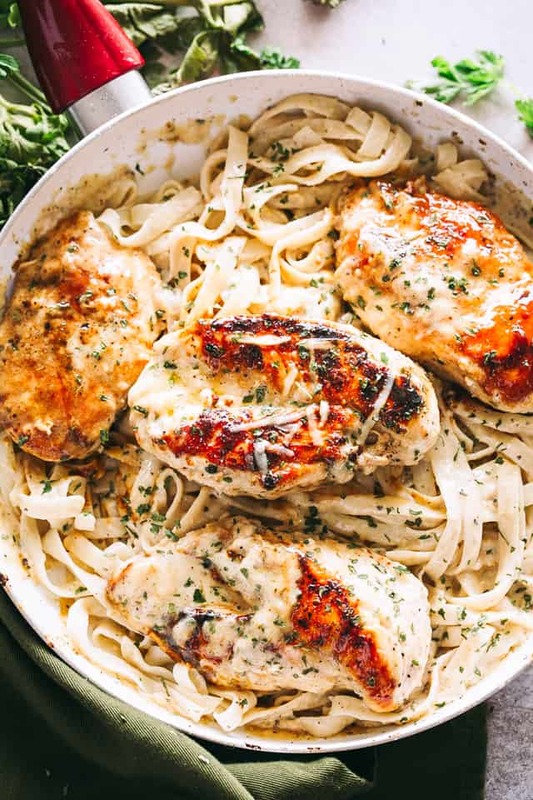 This chicken fettuccine recipe looks amazing – I can’t wait to try it! 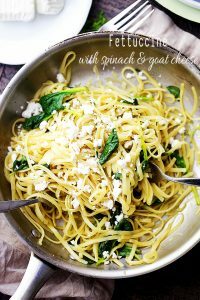 I usually make chicken and broccoli Alfredo in a cream cheese sauce (http://doubletherecipe.com/2016/01/13/chicken-broccoli-fettuccine-alfredo/) but I am definitely going to have to make this soon, i love the idea of using kefir to make a healthier alternative. 20+ Pasta Recipes for Every Day! Great alternative to use something so much better for you! I love using greek yogurt in lots of things so it would be fun to try this with the smoothie idea! Thanks! Just came across this on Pintrest! I am in Canada and we don’t have Kefir….I see that you said you an use plain yogurt. But I’m wondering if plain Greek yogurt would also work?! Hi Erin! Because Greek yogurt has a strong sour flavor, I would only use it IF you were comfortable with a very sour taste. Thus, the sauce will turn out, but depending on your taste preference, I’d use it with a bit of caution. Thank you!! But the Kefir is sour tasting correct? Yes, it is. That’s why I said if you’re okay with the sour taste, then definitely go with the Greek yogurt. I don’t know if I prepared this dish incorrectly. For some reason it did not turn out well. It was kind of sour tasting and I used only fresh ingredients. Maybe I will try making it again and see if it turns out better. Hi Mindy! If it was sour, then I can only assume that maybe you used more yogurt for the sauce? Although the probiotic benefits of Kefir are destroyed when it is heated, it is still a great idea to help lighten up this classic dish! Would you mind sharing what the nutritional facts are for this? Looks SUPER yummy. My husband and I are using a calorie counting site so it would be helpful to know. Thanks! I shared the nutritional info within the post. If you scroll up, above the recipe card, you will see where I discuss that this is around 500 calories per serving. I hope that helps! Well frankly, this is just ridiculously delicious looking. Can’t wait to try this with loads and loads of fresh herbs on top. 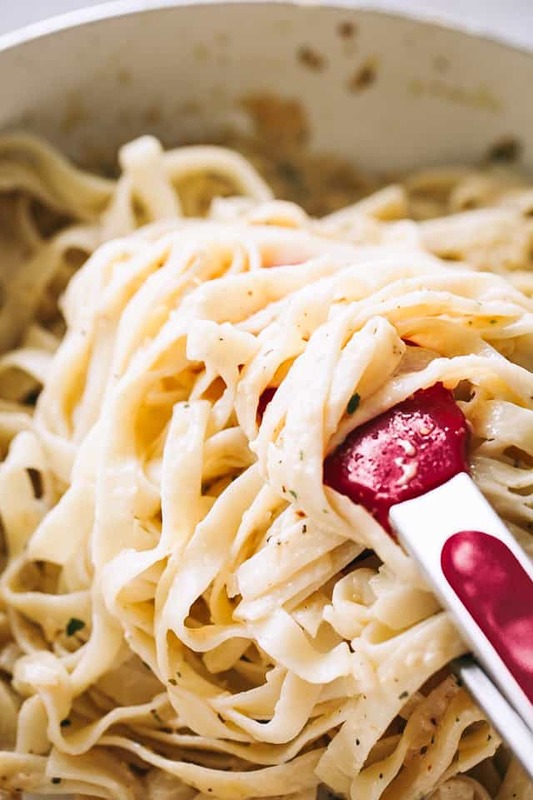 I like that you used kefir so that I can actually use regular amount of Fettuccine Alfredo sauce not cut in half portion due to the calorie. 😀 I seriously want to enjoy this meal without worrying about dieting. 🙂 Your pictures are very inviting!!! Alfredo is hands down my favorite pasta!! I just can’t handle all the guilt that goes with it – but this looks divine!! I love that you’ve used kefir in this recipe! What a brilliant idea. I want to swim in this sauce!! looks delicious!! This looks so good. It doesn’t look “skinny” at all! Oh wow this looks so delicious and not skinny at all, just how I like it! Filled with flavor. 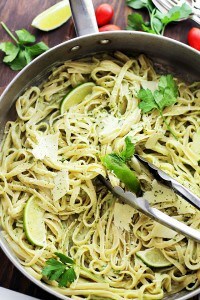 Oh yes, I need this fettuccine in my life, especially since I can eat it guilt free! One of our favorites! LOVE! This is just stunning, Kate, and I can’t believe it’s ‘skinnified’! !